For the first time, "America's Favorite Quiz Show," JEOPARDY!, comes to the Wii. The video game based on TV's No. 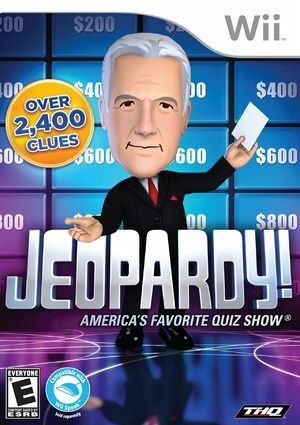 2 syndicated game show is voiced by host Alex Trebek and comes to life with an authentic show set that includes lights, cameras and a "live" studio audience. Inviting up to three players to compete with each other and represented by their favorite Mii character, participants test their knowledge in Jeopardy!, Double Jeopardy! and Final Jeopardy! rounds by providing responses to the clues provided. The Wii Speak technology can also be utilized to verbally respond to the clues. Additionally, the Clue Crew will make a cameo in the game to present contestants with visual clues. In addition to the main gameplay, participants can play the commercial break mini-games to unlock new, trendy outfits for their Mii characters. The JEOPARDY! video game includes a comprehensive tracking system that stores the players statistics, such as number of wins and fastest response time. This game can drop to below twenty FPS while playing despite running fullspeed. This is normal; the game suffers severe framedrops even on console. Wii Speak functionality is supported with an official Wii Speak peripheral. This game supports Wii Speak. Dolphin does not. Wii Speak functionality does not work in this game, but does not prevent it from actually playing. Wii Remotes can be used to input answers with an onscreen keyboard. Fixed in 5.0-2352. The graph below charts the compatibility with Jeopardy! since Dolphin's 2.0 release, listing revisions only where a compatibility change occurred.